Just did a Wordless Wednesday post on Nam Chau few days ago, thus I’ll be committing an unforgivable sin to repeat that on a consecutive basis. Call this laziness. Procrastination. Or sheer burnt-out. Those who are friends with me on Facebook would have known this from the ridiculous onslaught of status updates; mostly bordering on lunacy and peppered with an incredibly gloomy outlook. But hey … every cloud has its silver lining, at the end of every tunnel there will be a light and there should be fireworks to cap the dreary year with. Without fail. And for me, this extended weekend (taken for personal reasons, not a national initiative … wait for X’mas next week, people!) could not have come in a more timely manner. 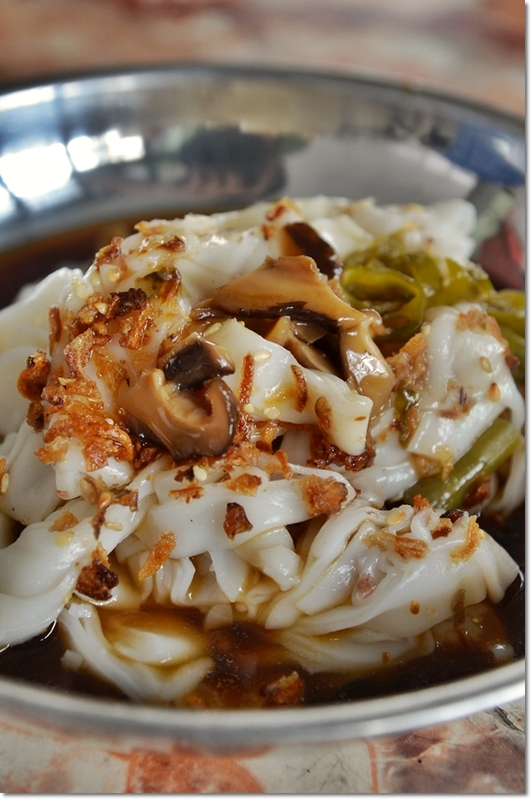 Read on to find out more about this chee cheong fun aunty that has been one of my favourites since a decade ago. 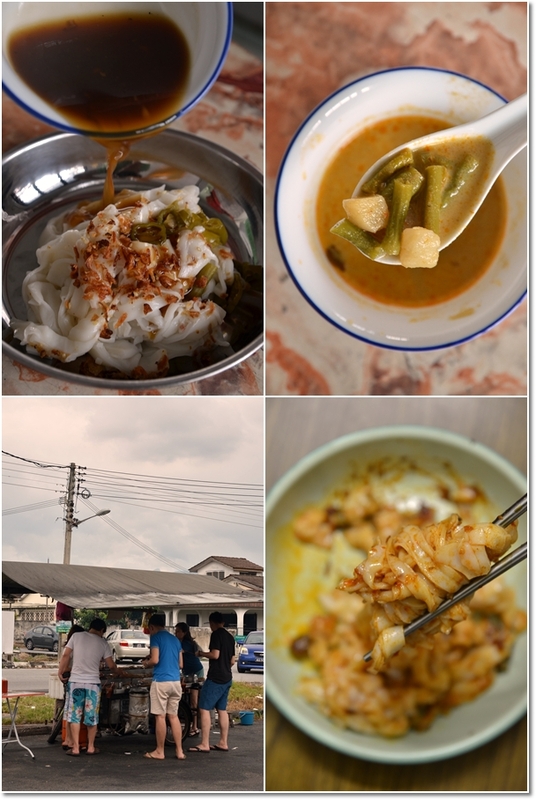 A roadside stall that opens only for a very short time frame; about 3-4 hours per day at Ipoh Garden South. This IS street food. Now, I have no idea that this aunty is still selling her much-beloved Chee Cheong Fun from her makeshift stall in Ipoh Garden South, parked in front of Kafe Sentosa Ria. Back in those days, Dad would religiously ‘ta pau’ packets of her CCF every Saturday after work. And myself and Grandma would be anticipating for our post-lunch fix (she opens only after 2pm) without fail. I used to favour Mushroom Gravy with chunks of pork over the usual combination of chili and sweet sauce. Until this stall managed to sway me towards the fiery choice. Now, this aunty’s CCF may not be the smoothest, or freshest that you can get around Ipoh. That accolade goes to the house in Pasir Pinji (read the full review HERE). Her mushroom gravy (‘tung koo chap’) pales in comparison to some of the better ones; being slightly watery and not laden with earthy, robust flavours of the chopped shiitake mushrooms. 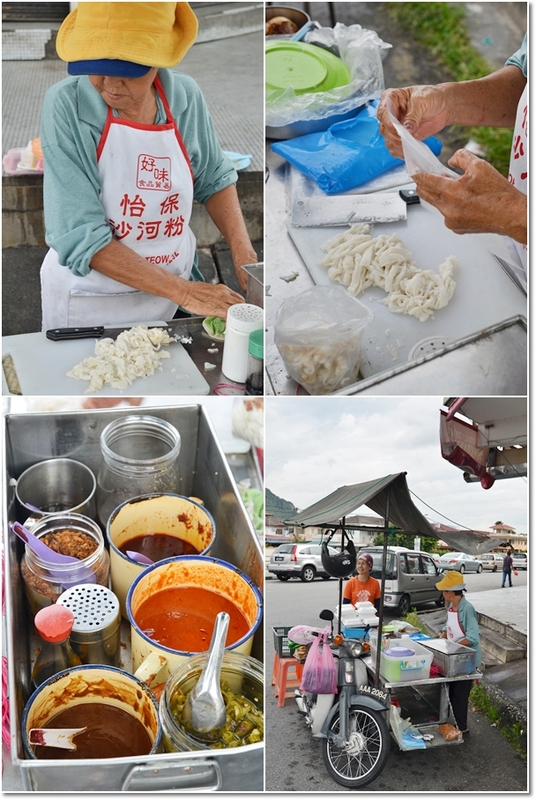 But where the other CCF stalls commonly use a generic garlic-based chili sauce and reddish sweet bean sauce (thim cheong) combination to flavour their rice noodles, this aunty goes the extra mile. She injects oomph into her repertoire of condiments; this killer chili oil packed with a fiery kick. You can also opt for curry gravy with long beans and potatoes to go along with your noodles, or opt for the plain Jane option; soy sauce and shallot oil. Just love how the chili oil adds a punch that no other CCF maestros in Ipoh have managed to do so far. Yes, the intense spiciness dumbs down the palate; even torching palates not used to the heat. We usually requested for the sauces to be packed separately (and you should too, to avoid from the noodles being soaked to an unpleasant soggy texture), and I would skip the normal chili sauce (which she provides as well), and the sweet sauce. I would go crazy with the chili oil; scooping spoonfuls of those onto the rice noodles studded with dried shrimps, sprinkled with sesame seeds and fried shallots. Oh yeah ….. if you insist, she sells pieces of ‘yong tau foo’ too. Very basic options of beancurd sheets, stuffed fish cakes and such. There is also one ‘lok-lok’ stall opposite of this. GPS Coordinates : E101 7? 12.0? N4 36? 31.2? Opens daily 2pm – 5pm. Closed on Wednesdays. *Still craving for more? Read up some Chee Cheong Fun stories published before. Haha … yeah, myself too. Very warming to the tummy and the mind, to see Tung Koo Chap huh? I swear two weeks in KL isn’t enough for me to enjoy all the best stuff there is! 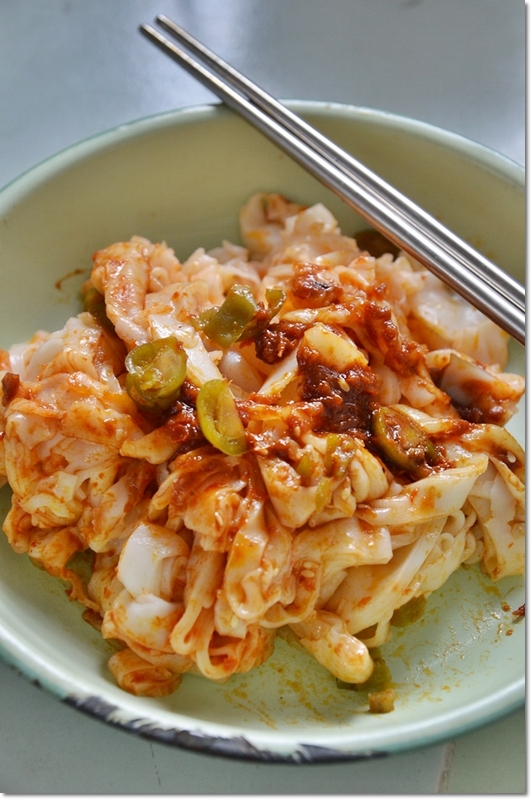 Chee cheong fun, mmhm……. Wait .. this one in IPOH okay? Not KL. Though in KL I am sure there ARE good CCF finds. Just escaped me. Lok Lok? Really? Hmm .. I am not an ardent fan of those, but CCF? Yeah. Damn right. My daughter and I too, are big big fans of chee cheong fun. She loved mushroom gravy while I loved chilli and sweet sauce and also curry with pig skin. The chee cheong fun at Bercham new market food court very cheap and tasty. We have them everyday when we are back in Ipoh. Hope whatever ails you stays behind in 2011 and happy holidays to you and your family ! Today, I finally located Kafe Sentosa Ria and the Chee Cheong Fun Aunty. Yes her Chee Cheong Fun is really good. Mr Motormouth your Chee Cheong Fun Aunty is alive and kicking, but couldn’t believe you have put her on the gastronomical map.